From left: RwandAir Customer Relations Manager, Olivia Ntambara; Holiday Aviation CEO, Gavin Simpson; RwandAir Country Manager South Africa, Thembela Dladla; Rwandan Ambassador to South Africa, Vincent Karega; and RwandAir Director of Quality Assurance, Sonia Kamikazi. Prospects are good for a major increase in inbound tourism from Rwanda and Zimbabwe following the establishment of the first air link between Kigali, Harare and Cape Town. 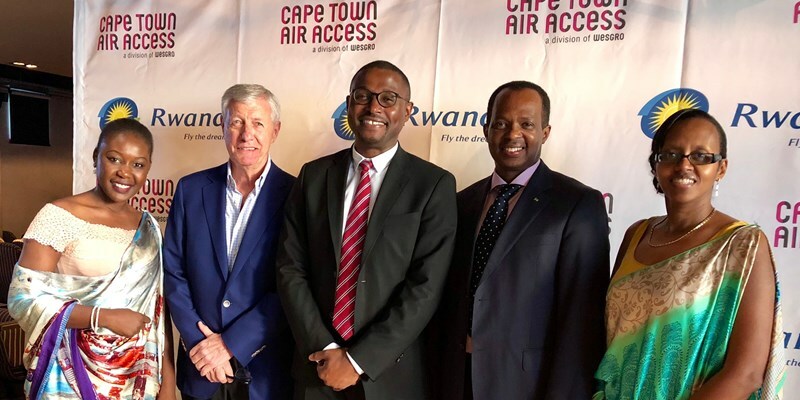 RwandAir’s first flight from Kigali via Harare landed in Cape Town on May 16, made possible by the Zimbabwean government granting Fifth Freedom rights to the Rwandan flag carrier. This allows the airline to carry passengers from Kigali to Harare, drop off and pick up passengers there before continuing to Cape Town; and doing the same on the return leg. RwandAir will initially serve the route four times a week (Mondays, Wednesdays, Fridays and Sundays) using a Bombardier CRJ900 NextGen two-class 75-seat regional jet. SA Country Manager, Thembela Dladla, says depending on demand, the airline will increase services and upgrade to a B737-800 on the route at certain times of the year. “Feedback from tour operators and travel agents has been very positive,” he says. At the moment, flight WB110 departs Kigali at 08h20, arrives in Harare at 11h00 for a 40-minute stopover (pax remain on board) to arrive in Cape Town at 14h45. Flight WB111 departs Cape Town at 16h00 to arrive in Harare at 19h00, leaving again at 19h45 to arrive in Kigali at 22h30. Gavin Simpson, CEO of Holiday Aviation (RwandAir’s GSA), says: “If the volume of traffic that is coming out of Rwanda into South Africa on the Johannesburg route is any indication, the inbound growth has been very substantial in the past few years.” He says RwandAir’s offices for reservations, ticketing, sales and support services at Cape Town International Airport are fully operational and a Cape Town sales manager has been appointed. Forward bookings are being received from tour operators and travel agents. Sonia Kamikazi, RwandAir’s Quality Assurance Director, says: “Rwandans have a good perception of South Africa. They see Johannesburg as a shopping destination but they are excited about coming to Cape Town because it is known as a tourist destination.” She says the South African government has assured Rwanda that it is working on making the issuing of visas to Rwandans more efficient. Cape Town is the 26th destination on RwandAir’s route network, which spans Africa, the Middle East, Europe and Asia in support of a growing Rwandan economy. Fifth Freedom flights from Kigali via Abuja to Accra were introduced three weeks ago. Flights to Bamako in Mali and Conakry in Guinea are to follow soon. A service to New York’s JFK International Airport is planned in 2019. Guangzhou in China is also on the cards, subsequent to the delivery of a third Airbus A330 later this year. Kamikazi says RwandAir’s competitive advantage is the central African location of Kigali, its main hub. Its secondary hub in Cotonou, Benin, serves West Africa. International destinations include Mumbai, Brussels, London and Dubai.